Mega Precious Metals Inc. (CVE:MGP) (PINK:MPRXF) stock spurt up on Wednesday, creating some heavy losses for shorters and possibly forecasting a bottom for the share price drop. 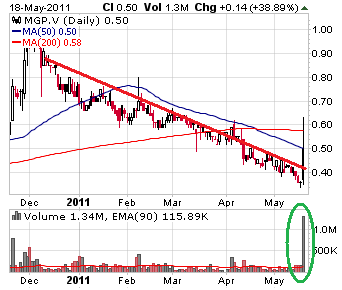 MGP share price broke the established downtrend that's been in play for nearly six months. Stock shot up 38.9% at the end of the last trading session. Trading volume was 1.3 million, 11 times the average of 115 thousand. The company issued a press release in reaction to the market activity and confirmed that no material change has occurred. Short squeezes usually are the main reason behind such cases and thus the rally is not likely to extend beyond one day. Intraday action actually shows the price declined towards the end of the trading session, already depicting weakness. The price surge might play a psychological role though - bears will feel discouraged from here on, especially considering that some numbers support the idea of the stock bottoming out. This downtrend has brought the market cap down to $38 million. That is barely above the last reported book value of $35 million, so the P/B ratio has become rather low even for an exploration-stage company. Mega Precious Metals is a junior exploration and development company focused on projects in Canada.The company was mainly working with The Red Lake Headway and North Madsen Projects throughout 2010. Hmm, so at .89, is the stock still being pumped, how about when we break 1.00? This stock, like almost any stock, is a gamble. The price is such that 1000 shares won't bankrupt anyone. Even 10,000 shares will not hurt most investors. Is the MGP deal a scam abetted by NIA? Who knows? Is there a Canadian SEC? If there is and it has more gumption than the U.S. SEC, the investor might be somewhat allayed in her fears. On the other hand, if the SEC counterpart in Canada is as flaccid as the U.S. version...well, gamble at your risk. Another idea: eliminate the U.S. and Canadian SEC's, Moody's, S&P, etc. or make them pay for bad advice/incompetence. The investor pays, why not those entities that are charged with protecting investors from scams and keeping the wonder boys honest? Stock is solid ...and will be big in 2012...like any investment ...buy low and hold...avoid the hype ...also Gary >>>your "pump & dump" remark makes no sense ...NIA recommends getting into the stock...but if someone buys it and then chooses to dump it...and they lose money whose fault is that?